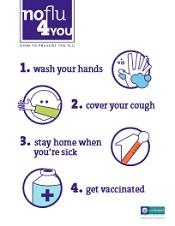 Influenza is preventable, always follow the “No Flu 4 You” guidelines to help keep yourself and those around you healthy. Flu vaccine for the 2018-19 season is now widely available. Vaccination is recommended for all people older than six months. It takes about two weeks after vaccination for it to take full effect. To find a flu clinic, search your zip code on flushot.healthmap.org or cdc.gov/flu or search the listings on 211maine.org. The Vaccine Information Statement (VIS) for this year's vaccine are posted online . To ask Maine CDC a question about the flu, you can submit a question by email. Sign-up to receive weekly influenza surveillance reports.